In Pima County, Arizona, the number of 3- and 4-year-olds enrolled in high-quality early education rose from 16.4 percent to 21.5 percent over two years. But nearly 15,000 kids still don’t have access to these programs. We need community leaders to act today before another generation of children enters school without the tools to succeed. Research shows that high-quality preschool levels the playing field and ensures children living in poverty enter school ready to learn. That’s why Cradle to Career Partnership is part of the StriveTogether Prenatal to Age 3 Impact and Improvement Network. Through this initiative, six communities from across the country are connected and supported to develop quality continuous improvement practices to get better results for families and children ages 0 to 3. 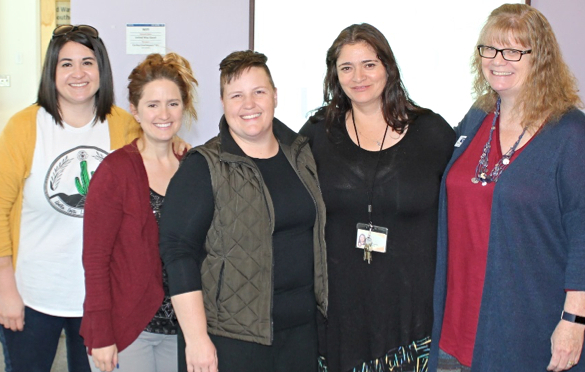 Our team from Tucson (Pima County, Arizona) relishes the intense learning opportunities and support provided by StriveTogether and NICHQ, with funding from the Pritzker Children’s Initiative. Our goal is to increase the number of completed home visits with families served by two partner organizations, Casa de los Niños and Child & Family Resources. Through home visits, these organizations begin working with families early — sometimes even before a child is born. This early intervention supports child development and builds relationships, ensuring that children are well-positioned to start school and that families understand the resources available to them. Strategies to increase home visits include more training for home visitors, regular assessment of relationships between home visitors and families, better messaging and stronger engagement with fathers. We aim to increase visits by 10 percent by June 2019. The focus of our work through the Prenatal to Age 3 Impact and Improvement Network is to explore the connection between cancellations of home visits and family retention. Families that are more engaged and present at visits feel more connected and see the long-term benefits of preparing their child for school, leading to higher retention within home visiting programs. Our first strategy to explore the impact and causes of visit cancellations is to test a short feedback survey at the end of home visits. We are currently in the middle of participating in the impact and improvement network, an 18-month “boot camp” for continuous improvement, StriveTogether’s unique brand of collaborative learning. We have finished several rapid-cycle improvement tests to see which strategies are most effective, and we’ll do several more tests before taking what we learn to staff at our partner organizations. In addition to collaborative improvement tools and practices, we’ve learned other lessons, including those described below. Rather than create a brand-new activity, weave new practices and interventions into existing processes. For example, instead of creating new obligations for parents, we explored whether interviews could be conducted during already planned quality assurance calls to parents. Connect to what you already know. When we began to incorporate empathic interviewing into our work, we realized this process contains elements of motivational interviewing — something Healthy Families staff already use. We could capitalize on those strengths and previous training rather than integrating completely new processes. Narrow your focus so you’re not trying to tackle everything. Starting small, maybe even with only one home visitor and a few families, is key to getting started. “Not letting perfection be the enemy of the good” is a useful principle to keep in mind. Help participants understand the purpose of their involvement to engrain the practice of data-driven decision making. For example, be sure staff and families understand the importance of their feedback so that they can see their role in outcomes. Cradle to Career Partnership team members and partner agencies jumped at the chance to be part of this impact and improvement network. We’ve found the in-person and virtual learning sessions with the other five community teams to be invaluable. Additional monthly coaching from StriveTogether and NICHQ have provided space to deepen, extend and test our learning. We continue to be enthusiastic and committed to the growth mindset and value the “fail forward” and other lessons from team-implemented rapid-cycle improvement opportunities. What are your questions about introducing and implementing a culture of collaborative improvement? 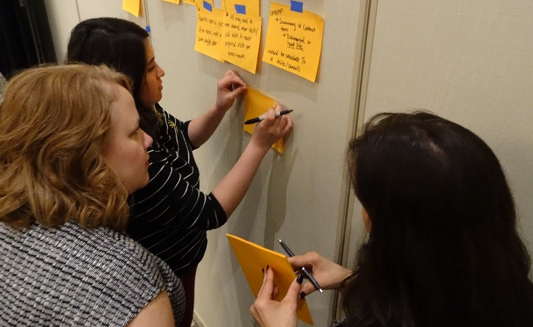 Guest blog post by Cradle to Career Partnership, one of six Cradle to Career Network members participating in the StriveTogether Prenatal to Age 3 Impact and Improvement Network, done in partnership with the National Institute for Children’s Health Quality. The team from Tucson includes family support and home visitation staff from Casa de los Niños’ Parents as Teachers and Child & Family Resources’ Healthy Families programs, as well as United Way of Tucson and Southern Arizona backbone staff from the Cradle to Career Partnership.